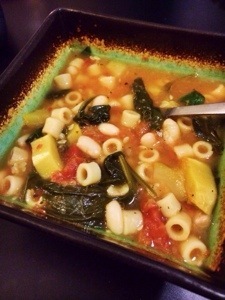 Second recipe of the year … MINESTRONE! 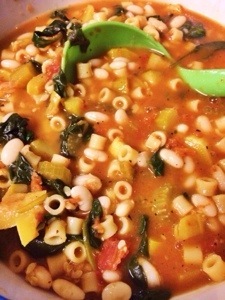 I love minestrone. Especially Olive Garden’s minestrone. 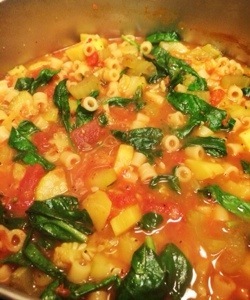 Every time I have declared that I will try and make minestrone, I end up making a type of “dump” soup instead. That’s when I just dump whatever veggies I have on hand into a pot and add broth. 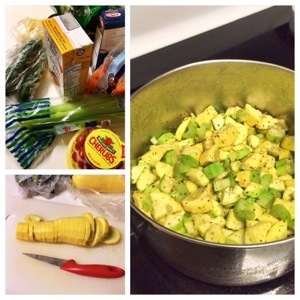 Quick, easy, hearty. So I finally got the ingredients and went for it. I still left out certain things like olive oil and cheese. I also changed out the carrots for celery. I hate cutting carrots. They fly everywhere. I must get better at actually measuring out my ingredients. I made like a lifetime supply of soup. Good thing my husband is usually super hungry when he gets off work. Next time I make this, I want to make more broth, more of the tomato and chicken broth puree. It’s amazing.